One of my favourite songs is “My Girl” by The Temptations, it has cracking lyrics for an old romantic like me, including the line “I’ve got sunshine on a cloudy day, when its cold outside I’ve got the month of May”. Well we are now in central Scotland in May and it is cold outside! I have been trying to pretend that it is warming up by wearing my shorts, but it is freezing. After our walk today we went shopping at Waitrose in Stirling, so I could stand in the dairy aisle (the coldest in the store) to warm up. This is a fine store but we have decided it is not up to the standards of Booth’s in Settle. I think I could become a critic for the various supermarkets around the country. Favourite is Booths in Settle, worst is Asda in High Wycombe (I would stress the staff are pleasant but the store is like an adventure playground. I am sure some parents leave their kids there for the day. The last time I was there, and it will be the last time, there was a group of youngster playing football in the fresh meat aisle. This was not just a spontaneous kick about, it appeared to be a full tournament. 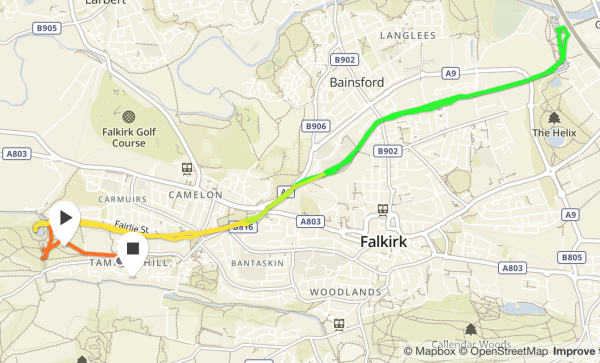 Before we left home we had a chat with our Scottish friend Bill, he told us that we must visit the Falkirk Wheel, this is not far from our current pitch at Carr’s Hill CL, so off we head. On arrival we are given a warm welcome by the car park attendant who not only tells us about the wheel but suggests options for walking. I like the idea of parking attendants, they provide a personal touch and it gives someone employment. For exactly the same reason I refuse to use self service checkouts in supermarkets, they might increase the profits of companies but it is not good for society as a whole. Time to get on with our day, otherwise there is a risk my blog will be confused with Billy Bragg’s (but his is far more articulate and has loads of followers). 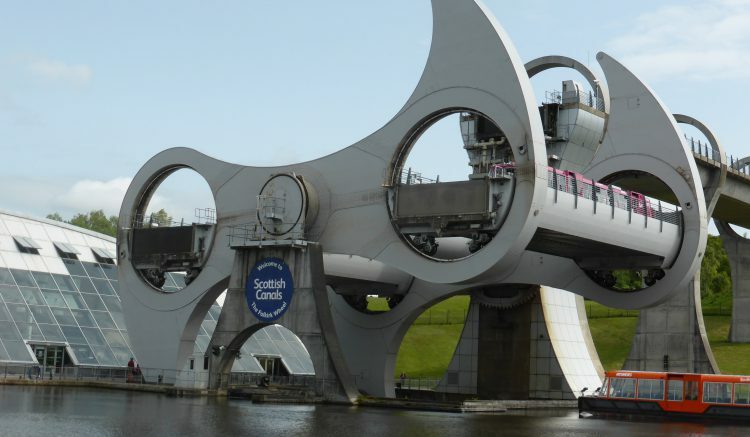 The Falkirk Wheel is a stunning bit of engineering. As we wait for it to swing into action I take a prime spot for photographs. Soon after a large American family arrive to sit on the bench close to where I am standing. The older female member of the family, I assume wife and mother, immediately starts to whinge. The reason for the disquiet from our overseas visitor is that she feels the whole thing is like an amusement park and serves no purpose. 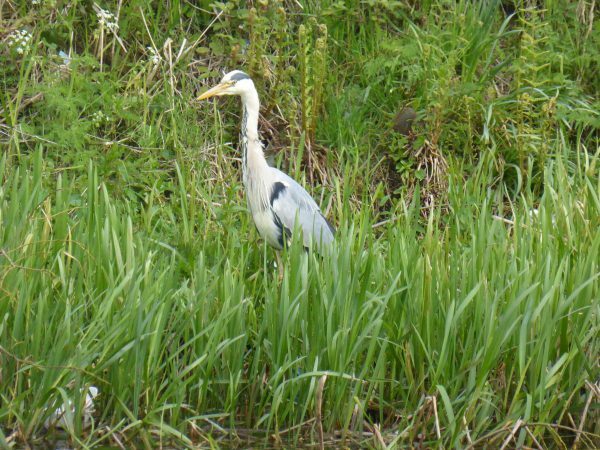 The older male, I assume husband (poor chap), tells her that it links two canals. To which the female with a level of absurd authority informs him that there is only one canal and this large basin at the bottom and the same boat keeps going around. I think about assisting the chap by telling his wife that there is a second canal, but feel that I would be wasting my breathe. I am left in total fear that this woman, and many others like her will be given the opportunity to decide the next American President. At moments like this I genuinely fear for our future. 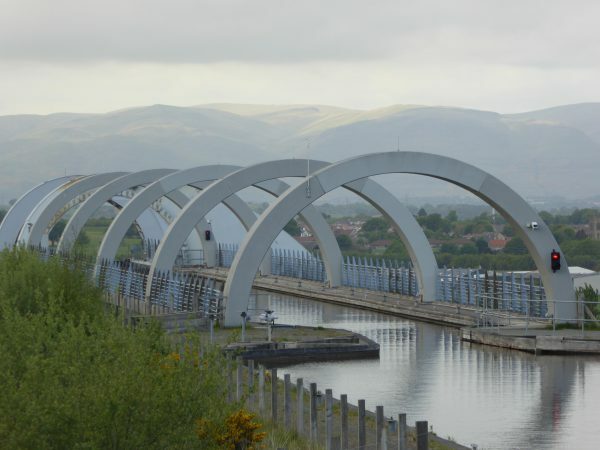 The Falkirk Wheel was built as a rotating boat lift, connecting the Forth and Clyde Canal with the Union Canal. The wheel was opened in 2002 and reconnected the two canals for the first time since the 1930’s. Prior to that they were connected by a series of eleven locks. 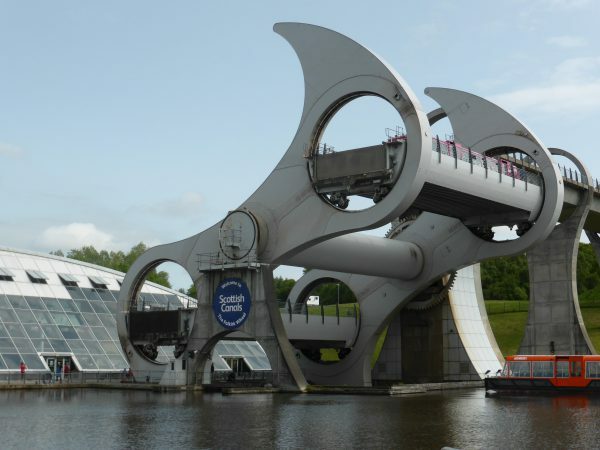 Despite the views of the American woman this wheel is unique, there is no other boat lift like it in the world. And when it turns it is stunning site. (It took too long for the impatient American, she obviously found the five minute wait too much). 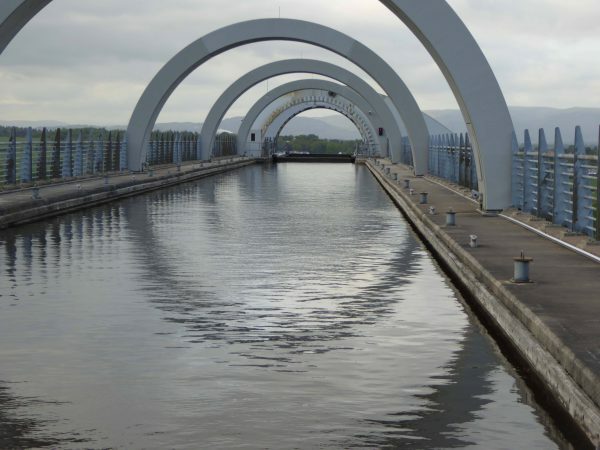 The wheel raises boats by 24 metres (79 ft) up to meet the Union Canal, it can lift 600 tonnes. Now that is impressive. I could write loads about the engineering and the way the project was developed, but better you go and explore for yourself. It really is a sight worth seeing. 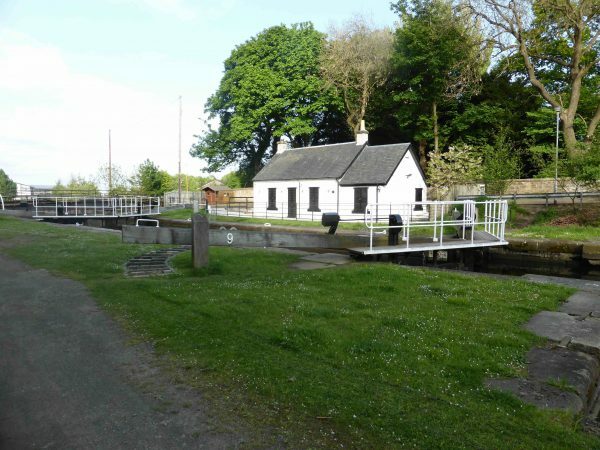 The helpful young lady operating the lock from the wheel basin to the Forth and Clyde Canal tells us that it is about four miles along the towpath to visit the Kelpies. 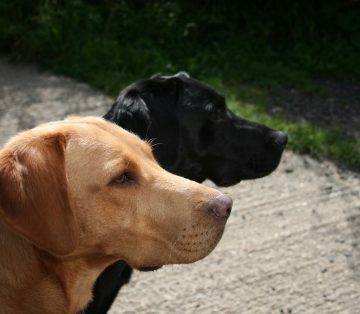 We enjoy walking along canal towpaths, so off we stride. The thing about canals is that they were built for industrial purposes linking towns together and often passing through areas you wouldn’t otherwise get to see providing another interesting perspective to a town and it’s industrial past. Long stretches of canals run through open countryside, our section today doesn’t but it is still enjoyable. There is the odd pleasure boat moored, but also a number of old industrial boats like the sailing barge moored by the Union Inn. 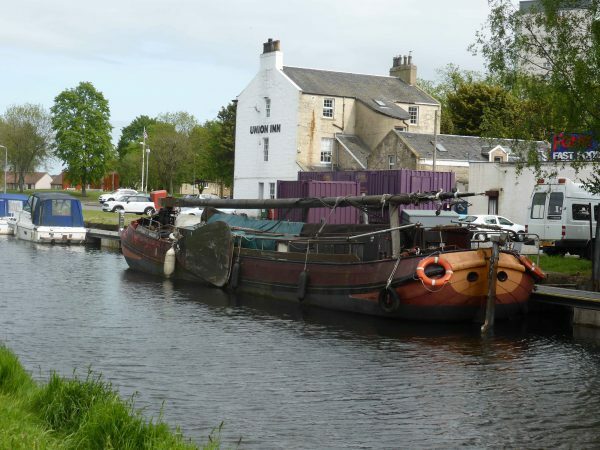 The Forth and Clyde Canal first opened in 1790, but by the 1960’s had fallen into decline and was closed. 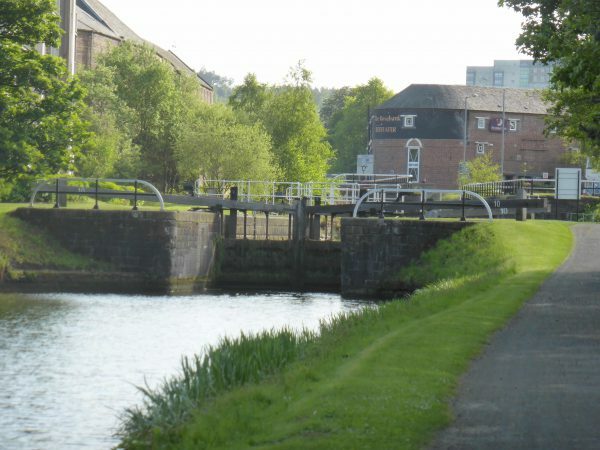 It is 35 miles (56 km) long and runs from the River Carron at Grangemouth to the River Clyde at Bowling, there are forty locks along the way. 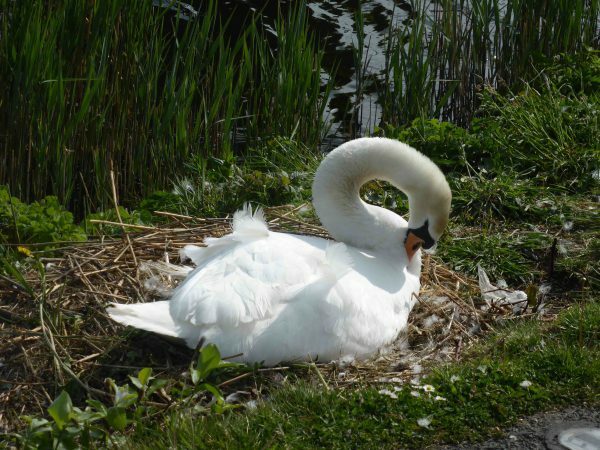 Although not in open countryside we get amazingly close to wildlife, there are moorhens about, a heron looking for a meal and a swan has built her nest right besides the towpath, we had been warned to watch out for these swans because they have been known to be aggressive to dogs, but thankfully not today. Driving along the M9 yesterday we glimpsed the Kelpies. Now turning a corner we get sight of them and you can see why they have become such an attraction. It is still another fifteen minutes before we are beneath them and admiring them close up. 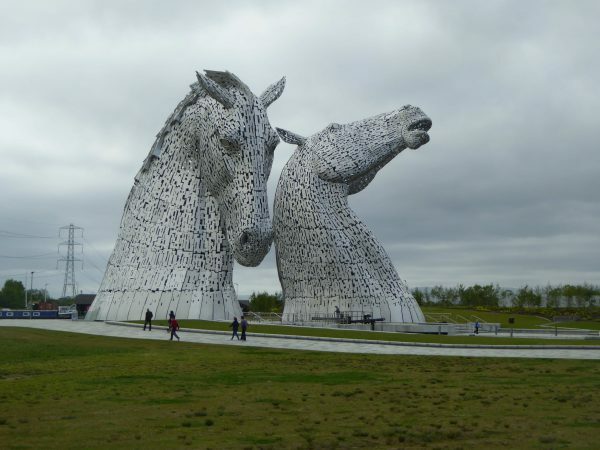 The Kelpies are 30-metres high and stand next to a new extension to the Forth and Clyde Canal near the River Carron, in what is known as The Helix a new parkland project built to connect 16 communities in the Falkirk Council area. Designed by Andy Scott the sculptures were completed in October 2013. 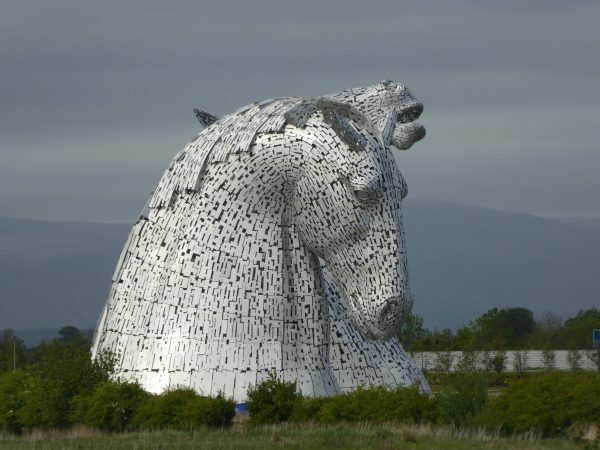 They are described as a monument to the horse powered heritage of Scotland. Dr Lyop was born and educated in Edinburgh and was a consultant in geriatric medicine at Falkirk Royal Infirmary. Through his expertise and efforts Strathcarron Hospice was opened in 1981. Reginald Adams was a qualified timekeeper, judge, starter and referee. He dedicated fifty years to Scottish swimming, he coached many Scottish champions and was awarded an MBE for his efforts. In 1875 Robert Barr extended the family business by selling carbonate drinks. It was such a success that he made it the focus of the company’s activity. By 1904 the company had launched Iron Brew, subsequently renamed Irn-Bru. From this I deduct that Falkirk celebrates a physician who made the end of many peoples lives more comfortable, a sports coach who made many happy with their achievements and a drinks manufacture who has supplied the means for people to litter the hedgerows of Scotland! 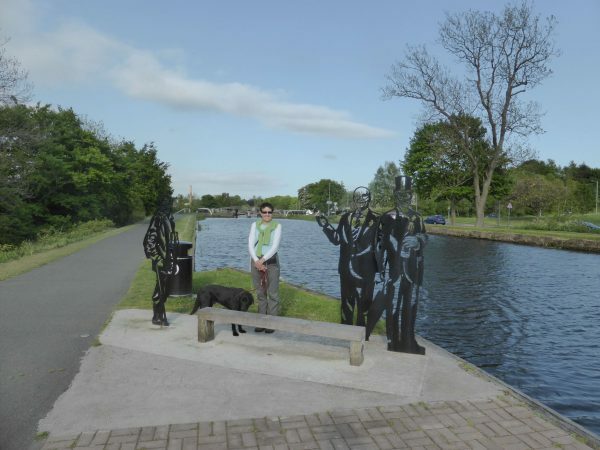 Lynnie joins them in a photo, she has done her bit making people feel happier about the towpath by picking up discarded cans and bottles and placing them in a waste bin. Picking up litter has become a feature of our walks this trip. I regularly pick up cans or plastic bottles to deposit in the nearest bin. I can only ever get a couple into my bag at a time, but if others were a little more thoughtful neither I nor others would need to pick them up in the first place! 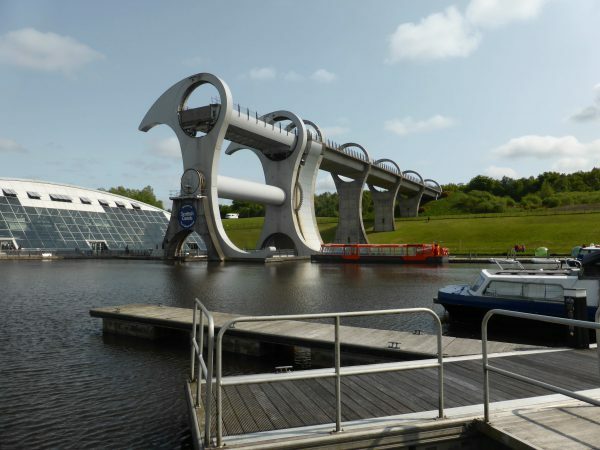 By the time we get back to the Falkirk Wheel the crowds have gone, so we walk up to the Union Canal to get a view of the structure from above. It is equally impressive from up here. 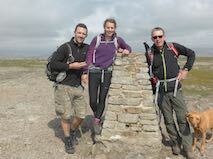 We have covered close to nine miles, It has been flat easy going and and my knee seems to have recovered. Probably time to find a hill to climb tomorrow!